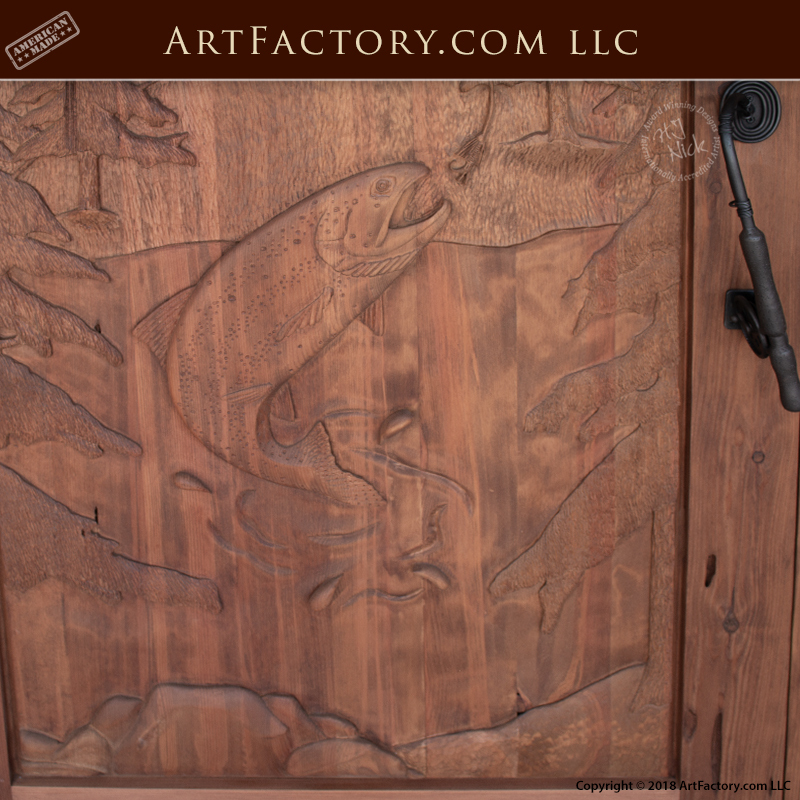 At ArtFactory.com, our hand carved doors are genuine works of certified fine art, and this trout fishing theme door is no exception. Each door is carved with a multi-level, high relief process that creates both positive and negative reliefs. This type of detail (including elements such as carved out undersides of leaves) cannot be achieve using any machine. All of our wood carvers are classically trained in the old world methods of fine art carving. To be recognized as certified fine art, all carvings must be in the same hand technique. That is why our products are never gang carved, CNC machined, or carved using any type of fast process. This assures that each door is a unique, one-of-a-kind work of fine art. These details are especially relevant in the eyes of appraisers when judging a piece as fine art. This trout fishing theme door is built from full length, naturally air cured, genuine timber. 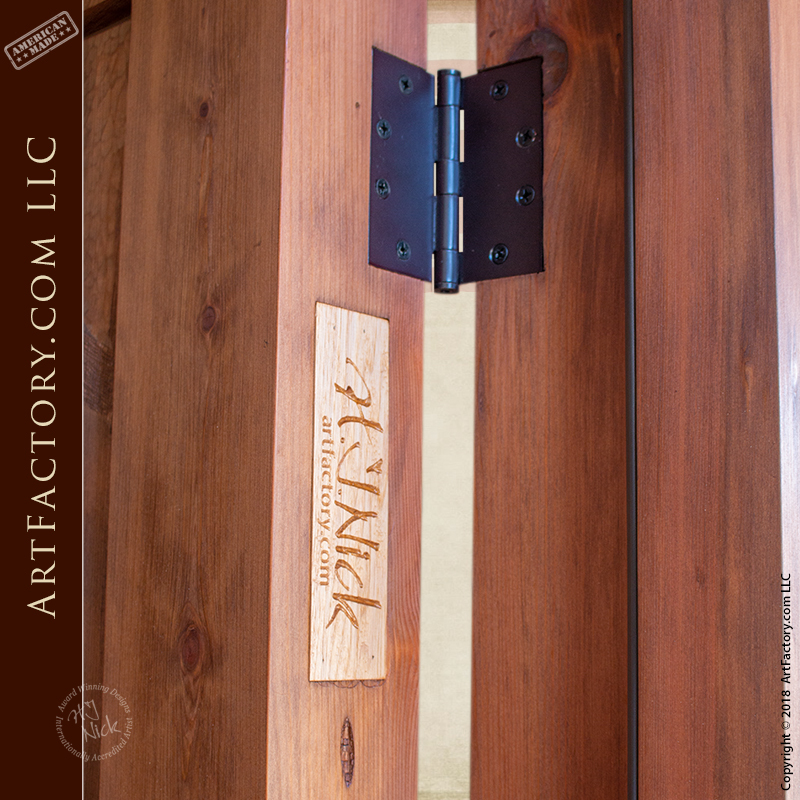 Unlike the doors you find at big box retailers, when we say wood, we mean "The Real McCoy". 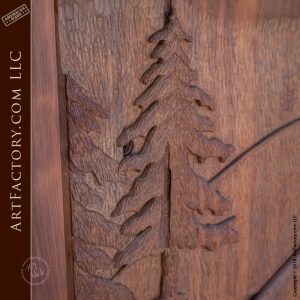 We construct our hand carved, solid wood doors with the same strength, and techniques, used by royalty in ancient times to fortify their castles and fortresses. Every door that comes out of our factory is hand hewn, pegged and dowelled, with mortise and tenon joinery. This old world, tried and tested method of craftsmanship guarantees for a door that is built to stand the test of time. Share your love of wilderness with the world, by greeting them at your very own trout fishing theme door. The carved wilderness scene on the door features a trout jumping out of a mountain stream to catch a fly fisherman's lure. There are carvings of pine trees and snow on the mountains and these designs extend onto the etched glass sidelights. This type of fluid design scheme makes the difference between fine art, and ordinary entrance doors. That is why our master carvers painstakingly create each individual pine needle and fish scale by hand so that no two are alike, just as would be seen in nature. Designs such as this intricate carving are a trademark of our master carvers. 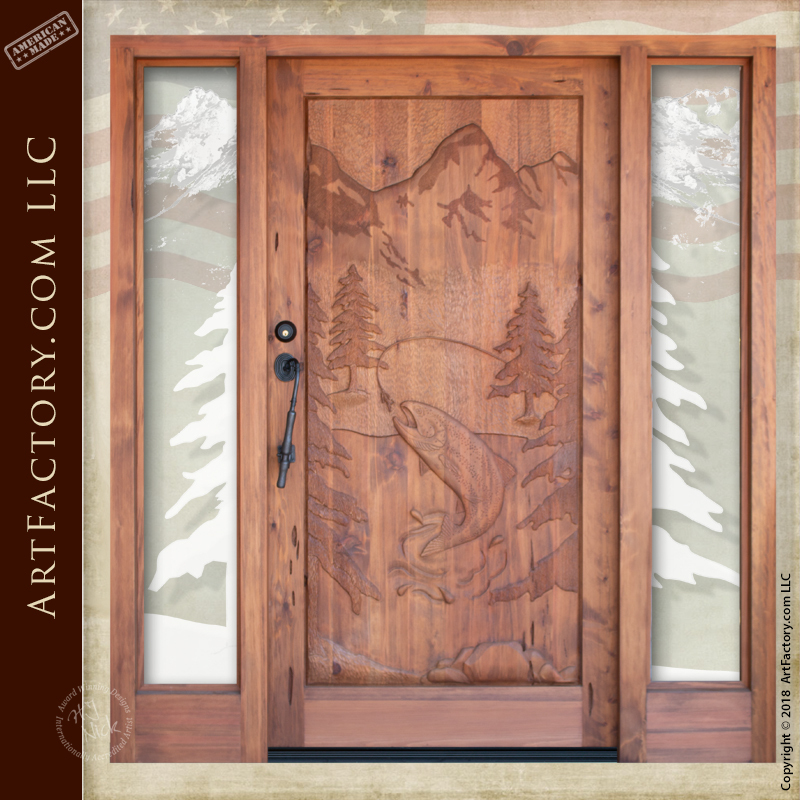 In addition, the door's sidelight windows feature etched glass pine tree and snowy mountain artwork. All of our sidelight and transom windows are built with thick, dual pane glass for maximum security and energy efficiency. This makes for an entrance that is a true display of both style, and security. We can etch any design that you choose into your sidelights, or choose from any of our clear, textured, or decorative glass choices. We also offer popular options like French panel sidelights, additional transoms, and wrought iron security grills. The prefect finishing touch on the trout fishing theme door is our popular fly finishing custom door handle. It is just one of many styles of fishing themed door pulls that we offer. At ArtFactory.com we believe in building furniture and doors that are not something that you just use for a few years and then throw away. Building items that are disposable is a practice that is unique to the past fifty years. In the old world, when a piece of furniture was built, it was built from solid, natural materials by master craftsmen. Most importantly, it was built to last forever. Something like a solid wood entrance door would be passed down through a family for generations along with the home that was also built to last forever. 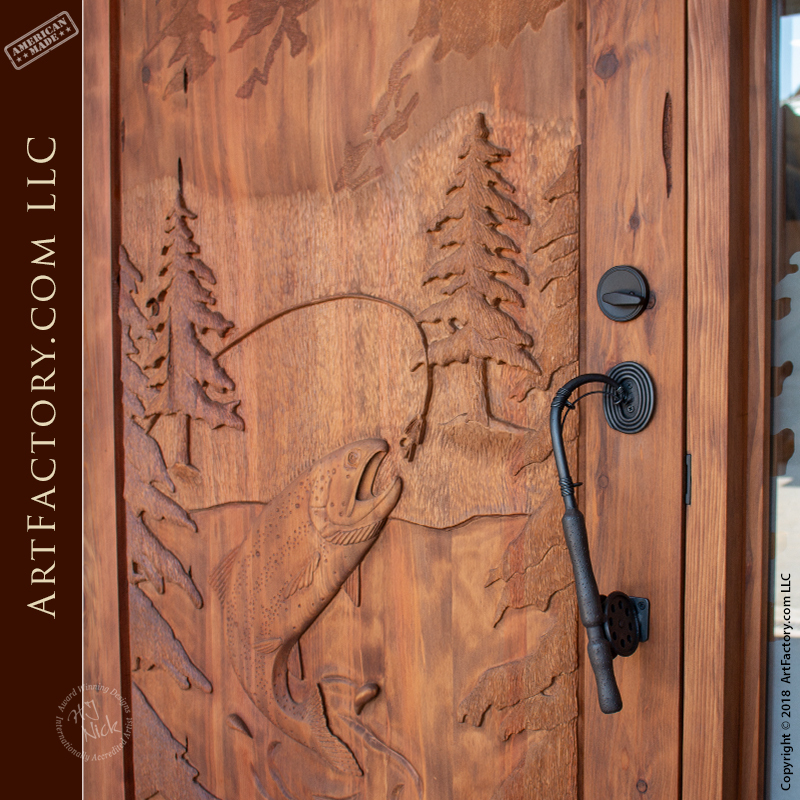 With this trout fishing theme door, handcrafted from solid cedar cypress (all wood types are available), we have carried that tradition of built to last craftsmanship into the 21st century. A true modern masterpiece inspired by historic designs, and built with period correct methods and materials. 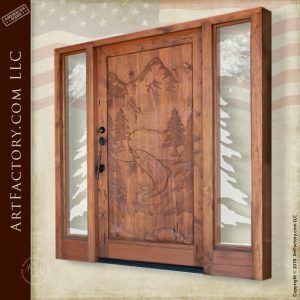 This door is perfect for any log home, cabin, or lodge entrance. It can be made as an interior or exterior door for either your residential or commercial property. We can build a custom solid wood door for you in any wood type that you prefer. We never use particle board, laminates or veneers, when we say wood, we mean "The Genuine Article". Building a family legacy has been going on since the beginning of time. Building heirloom furniture and doors intended to last forever is one of the primary ways we all have in achieving some small part of immortality. These cherished family items will touch our loved ones for many years to come through physical interactions as well as family photos. Many societies, including the Egyptians and Mayans, as well as European royalty and aristocracy have created and passed down heirlooms for thousands of years. In fact, if it were not for these artifacts, it would be impossible to know these people ever existed, how they were important to history. This is also the case in the 21st century within your own family. No matter if it’s a simple, hope chest with your personal message or name as a gift to a loved one, or an extravagant, fine art quality, master handcrafted trout fishing theme door, these items will be important to the story of your family history long after we are gone. The meticulous finish has been done in age old technique, using a 23-step hand rubbed process. We begin with fine hand sanding, and infused open grain hand applied stains. That puts the finish in the wood not just sprayed on it. This allows for the fine natural wood grains to show to perfection. There are then 20 additional steps requiring the application of wax, oils and lacquers with curing times between each process. This method is performed on all furniture and door wood surfaces inside and out. This tried and tested finish detail is required in the making of a one-of-a-kind, family heirloom quality product that meets world class investment quality standards that will stand the test of time. This process is the only way with little maintenance and the simple process of cleaning with oil will allow for a beautiful natural patina that will make this door more beautiful over time. Our combination of the finest all natural materials, and master hand craftsmanship allow for us to offer a quality of product that is unsurpassed anywhere else, at any price. This is not only an investment quality door, it is an appreciable asset that will add to your financial net worth. In the eyes of your family, it will become a cherished heirloom and a priceless piece of immortality that will be tangible for generations. It will serve as a way to celebrate your life, and its direct effects on who they are and what your influence was on your family's history. True artifacts enhance and enrich all of our lives in a way that mass-produced merchandise never will, thus preserving the best of mankind and expressing our love for each other. The trout fishing theme door as pictured features our popular fly fishing custom door handle (HH058C) with a black patina finish. Our custom door pulls are handcrafted by master blacksmiths using hand forged wrought iron. Customizable hardware can add the finishing touches to the theme of any of our custom wooden doors. Our blacksmiths hard forge, and hand patina finish each piece of custom hardware to perfection. Every hardware product is hand hammered over a coal fired forge, and guaranteed not to corrode. 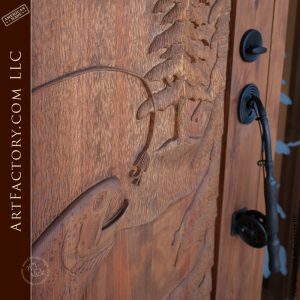 Our proprietary, hand applied, heat infused, advanced patination process assures that you will have the perfect custom door hardware. With this process, a hand applied iron oxide patina is infused to the metal at over 1000 degrees Fahrenheit. This assures that it will stay beautiful for years to come with little or no maintenance. Our in-house master wood workers, and blacksmiths handcraft all custom furniture and doors to your design specifications. We only use the highest quality materials. All of our wooden furnishings, doors, and gates are made from solid, full length, naturally air dried timber. We believe in the quality of our products in craftsmanship so much that as result, our custom interior and exterior doors and all of our products are guaranteed forever. 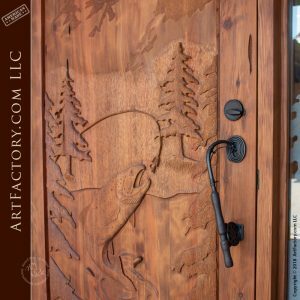 Call now for a custom quote on the trout fishing theme door at 1-800-292-0008, or any of our other fine art quality custom entrances. Like all of our products, this door was handmade in the USA at our Scottsdale, Arizona factory. 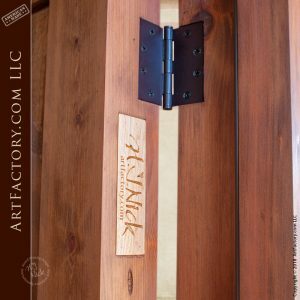 ArtFactory.com is an American manufacturer of custom doors, door hardware, iron gates, and designer furniture based in Scottsdale, Arizona. Featuring designs by H.J. Nick, we have been designing and building some of the world's finest furnishings, all hand crafted in America, since 1913. Most of our clients want a furnishing that has a big WOW factor and timeless elegance. They all want investment value furnishings that make a proper statement reflecting their personality, or the personality of the environment for which the designer custom furnishings are intended. Our master level craftsmanship ensures your custom wrought iron gates and furnishings will stand the test of time, and are guaranteed forever, backed by over a century of fine craftsmanship.